The Etruscan Liber Linteus is a manuscript which was found in Egypt on the bands of a mummy. Dating back about 2,200 years, this text is written in Etruscan, a language that was used in Italy in ancient times. It remains mostly untranslated because of the lack of knowledge about the Etruscan language, though the few words which can be understood indicate that the text is most likely a ritual calendar. The mummy and its removed wrappings are now in the Zagreb Museum in Croatia. It is also the only example of a book written on linen cloth (hence the Latin name Liber Linteus). Moreover, it is the only Etruscan book handed down to posterity. Originally it was a scroll which was brought to Egypt for unknown reasons. It was later cut into strips used to bandage the mummy of a woman, probably during the 1st century of our era. Putting the stripes the one near the other it was possible to reconstruct a part of the original manuscript, consisting of 230 lines of text and 1200 words that can be read more or less clearly, and 100 more words that can be reconstructed from the context with a high degree of certainty. In 1891, the wrappings were transported to Vienna, where they were thoroughly examined by Jacob Krall, an expert on the Coptic language, who expected the writing to be either Coptic, Libyan or Carian. 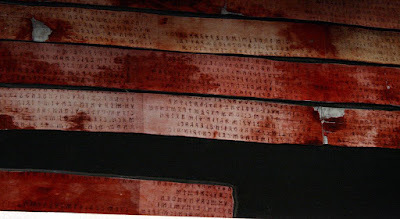 Krall was the first to identify the language as Etruscan and reassemble the strips. It was his work that established that the linen wrappings constituted a manuscript written in Etruscan. At first, the provenance and identity of the mummy were unknown, due to the irregular nature of its excavation and sale. This led to speculation that the mummy may have had some connection to either the Liber Linteus or the Etruscans. But a papyrus buried with her proves that she was Egyptian and gives her identity as Nesi-hensu, the wife of Paher-hensu, a tailor from Thebes.